Q1 : Why is the question of a scientific method particularly important in sociology? The question of scientific method is important because it helps sociologists to acquire knowledge. Sociologist deals with different societies whose culture may be similar or different. They have to conduct research and field work in which they need to take opinions and feelings of people or respondent in that area. Hence, sociologists try to adopt an objective point of view which is neutral and not based on one's own perception. Some sociologists like Emile Durkhiem believed that in order to study the society with objectivity, it is important to have a scientific approach. Therefore a need for scientific method was felt. He even carried out a scientific study on the phenomenon of 'suicide' by giving various rules in sociological method. Q2 : What are some of the reasons for `objectivity' being more complicated in social sciences, particularly disciplines like sociology? Objectivity means being unbiased, neutral or based on facts alone. (i) In case of social science, especially sociology, objectivity becomes more complicated because, like every human, there are some notions perceived by sociologists which make it difficult for him/her to study the culture and norms of a different society in a neutral manner. This can lead to incorrect research. (ii) The sociologist who is conducting a research can also get biased if the issues are related to his/her society and can imply his/her personal notions to that study. Hence, despite of being reflexive there are chances of unconscious bias. (iii) There are many versions of truth in the social world. A boy and an old person would have different notions on a particular thing. A shopkeeper and a customer would have different ideas regarding the 'good price' of a product. Thus, there is no universal truth in social sciences, making them difficult to arrive at a conclusion. (iv) Sociology is a 'multi-paradigmatic' science. There are different schools of thought that sometimes contradict each other. As a result, 'objectivity' becomes complicated in social sciences, especially sociology. Q3 : How do sociologists try to deal with these difficulties and strive for objectivity? To deal with the problem of objectivity sociologists use the technique of 'self-reflexivity' or 'reflexivity'. The sociologist views opinions, norms or behavioural patterns of different societies from all the perspectives. The sociologist continuously subjects her own attitudes and opinions to self-examination. Also, emphasis is laid on proper documentation of the research. This helps others to retrace the steps taken by the sociologist and scrutinise the study that has been conducted. 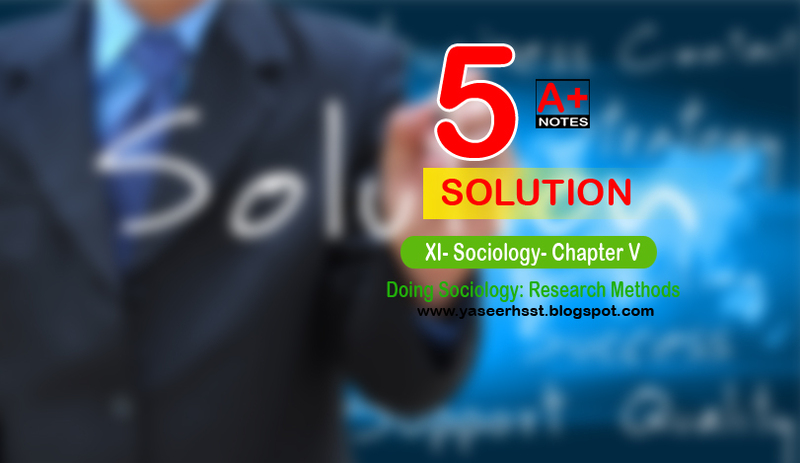 It also helps the sociologist to check and recheck his/her work. The sociologist then tries to judge different conceptions of people. Thus, the sociologists take objectivity as a goal of a continuous ongoing process rather than an already achieved end result. Q4 : What is meant by `reflexivity' and why is it important in sociology? 'Self-reflexivity' or 'reflexivity' is a technique to deal with the problem related to objectivity in social science and is closely related to empathy. In this, the social scientist views different opinions of the people in an unbiased or a neutral manner. Attaining objectivity is a difficult and complicated task in social science therefore, reflexivity becomes very important to carry out social research. There are different schools of thought within the subject of sociology that study issues from different perceptions and ideologies. At these places the sociologist uses reflexivity. Q5 : What are some of the things that ethnographers and sociologists do during participant observation? (i) They either live or spend most of their time with the community people upon which the research is to be carried out. (ii) The sociologist or the ethnographer almost becomes like a part of the community. (iii) They participate with the communities in their rituals and customs, and record the observations on a regular basis. (iv) The sociologists and ethnographers have limited people from the community on whom they depend for the information. These people are called informants or principal informants. (v) Although the sociologist's goal is to study a specific area of interest, but the overall goal of the participant observation is to learn about the entire life of community. Q6 : What are the strengths and weaknesses of participant observation as a method? (i)It provides a very rich and detailed picture of the people on whom the research is being conducted. (ii)The sociologist can talk to the native people of the community directly which helps in the authenticity of the data. (iii)The sociologist is free to ask endless number of questions to the person. This is not possible in case of questionnaire and survey. (iv)A daily record is maintained which reduces the chances of incomplete data. (v) It helps in correcting initial impressions that may often be biased. (vi) Because of the long hours spend with the field many errors and biases are avoided that are present in other methods. (i) The method involves a lot of time and effort. (ii) It also involves lot of expenses during the work. (iii) It is not necessary that the report consists of the views of the insider or of the sociologist, as the sociologist may become consciously or unconsciously bias in selecting what to write and what not to. (iv) There is no other version available to check or confirm the findings except the sociologist him/herself. (v) The sociologist or anthropologist is only able to study a very small community. Therefore, it cannot be guaranteed that the observation of the study of the village is really common in the larger community. (vi) The report of the sociologist based on participant observation method is often criticised to be biased by other sociologists because of the one-sided relationship they project. Hence, it is advised that the report should be translated in the local language of the community so that the people of the community can read and make sure that the report contains proper information. Q7 : What are the basic elements of the survey method? What is chief advantage of this method? (i) Survey is the best method applied in studying a large area. (ii) It is mostly based on random sampling. (iii) These samplings are done in such a way that the samples represent every strata and characteristics of the community. (iv) Random sampling is preferred to avoid biasness. (v) Interviews and questionnaire techniques are used in sampling method. (vi) The questionnaire can be filled by the respondent at his place and sent through post or the sociologist himself may go to the respondent and complete the questionnaire. (vii) The questionnaire can be filled and sent through email. (viii) The interview can be conducted online or on telephone. (i) Survey method is the best known sociological method. In situations where census is not possible survey method is used. (ii) It gives an accurate picture of the community through sampling. (iii) In comparison to census or participant observation, less time and money is spend. (iv) It provides a real picture that is made on the basis of collective representativeness than on single individuals. (v) Many problems are visible at this level, which cannot be identified at the micro level research. Q8 : Describe some of the criteria involved in selecting a representative sample. (i) The representative sampling is done in such a way that it represents and recognises all the relevant groups of the particular community. For example if the lifestyle of working women in India has to be studied then five samples would be collected, each from the organized sector and unorganized sector. Then the combined study is conducted on the basis of these samples. (ii) These samples are randomly selected, that is, they are to be selected on the basis of chance. This process is known as randomisation and depends on probability. The randomisation is done through lottery method, rolling of dice, use of random number tables prepared for this purpose and random number generated by calculators and computers. Q9 : State some of the weaknesses of the survey method. (i) It is not possible to get detailed information in a survey method. (ii) There are a number of respondents and the time spent on each respondent is limited. (iii) The detailed answers that require detailed prompting cannot be asked again once the questionnaire is filled and sent. (iv) These differences in the way the questions are asked and answered could introduce errors into the survey. (v) Questions of a personal and sensitive type cannot be asked. If it is asked then the answer would definitely be given in a safe manner by the respondents. This will make error in the survey. Q10 : Describe main features of the interview as a research method. (i)It is conducted in the form of conversation which is shaped by certain guidelines and questions between the researcher and the respondent. (ii)It is used in surveys and participant observation method. (iii)The interview is flexible in its structure. (iv)This flexibility can lead to a change in the mood of the respondent or lack of concentration, which is one of its disadvantages. (v)Some interviewers have very structured format with specific questions whereas some have loosely structured format with only a check-list of topics rather than the actual questions. (vi)During interview the interviewer can ask cross questions or other questions that are required during the process which are not possible in a questionnaire. (vii)Use of recorders and other equipments are also taken during the interview. Their use makes the respondent uncomfortable that introduces a degree of formality into the conversation, which is another disadvantage. (viii)The mode of recording depends on the social and physical circumstances in which the interview is conducted. (ix)The authenticity of this method also depends on the memory of the interviewer after it is conducted. (x)Sometimes important information goes unnoticed or it is not at all recorded. (xi)On a whole, a good interview is often based on the rapport build by the researcher with the interviewer.